Buttery, flaky garlic butter crescent roll dough with melted cheese, baby spinach and Sara Lee® Premium Meats. 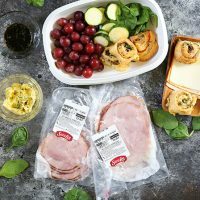 These Ham and Cheese Pinwheels are made four ways with a variety of flavored fillings, sliced deli meat and cheeses, then baked until golden brown, gooey and crispy. It’s been a busy past few weeks wrapping up the end of summer and getting back into a structured schedule. One thing that has made the transition easier is meal planning lunches for the week in advance. 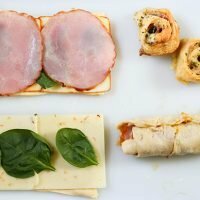 I’ve been making these ham and cheese pinwheels for a few years now. My grandma used to make them for lunch when I’d visit her. Since then, they have been a family favorite passed down! 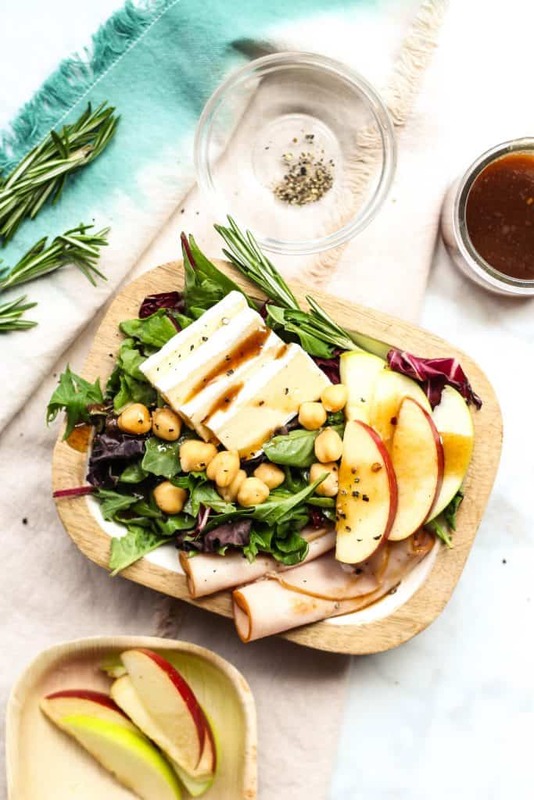 Not only is this a super easy lunch recipe to make for the weekday, but it also packs a variety of flavor options that even the pickiest eater will love. 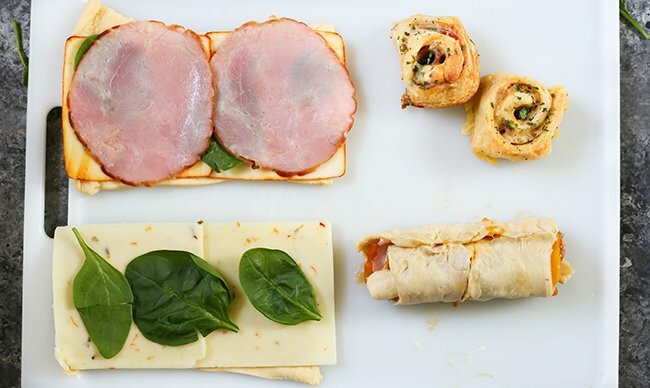 Over the years, I’ve made pinwheels in a variety of ways with Sara Lee® Premium Meats. 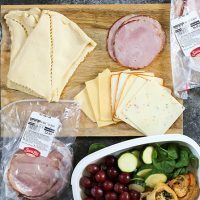 I always come back to these Ham and Cheese Pinwheels made four ways because this recipe has a flavor for everyone in the family. They are seriously so good! I could eat them every single day for lunch! They are perfect for sharing, too. I like to meal plan in advance for our family and pack them for lunch with a variety of fresh fruit and vegetables. They can be assembled the night before and baked, then packed away in individual lunches. Sara Lee® Honey Ham is my go-to deli meat behind the deli counter. In fact, you’ll find a variety of their premium, high-quality cut of meats have a delicious fresh taste. I always pick up a few freshly-sliced, affordable and premium quality flavors to pack in lunches throughout the week. Plus, everything for this recipe can be purchased in one stop from your local grocer, which makes it super convenient to grab the ingredients on your way home from running errands. 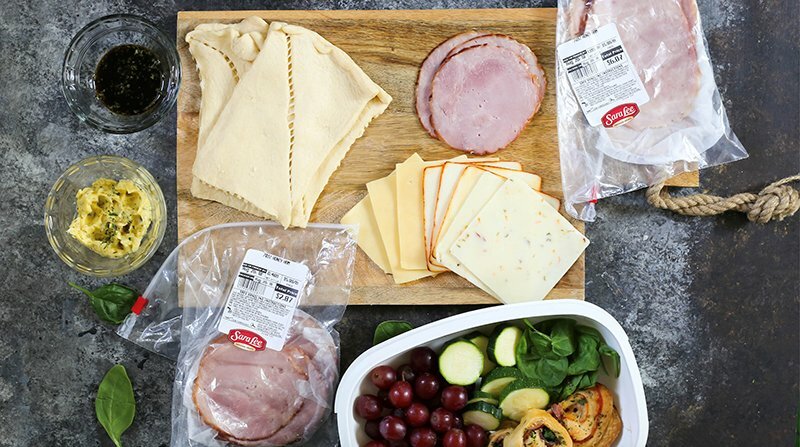 All you need to do is roll out the crescent dough, add a flavored spread and top it with sliced cheese, Sara Lee® Honey Ham and baby spinach. Then, I roll each rectangle up and pinch the dough at the seam to seal the outer edges. Next, cut the roll into four slices. Place each round in a prepared baking dish, then bake it in the oven. 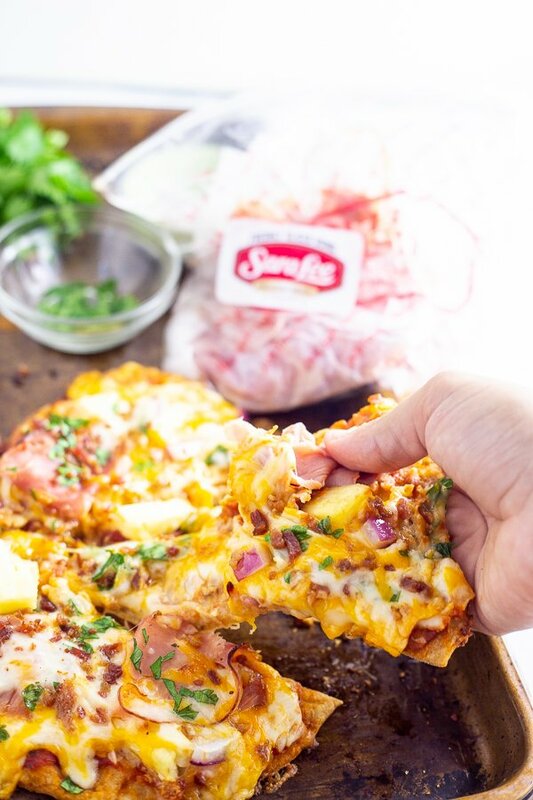 If you’re looking to save even more time in the kitchen and want to try new recipes for your family or a party, try swapping out the crescent dough with a tortilla shell. This no-bake pinwheel is a fun alternative and a huge time saver! I even like to switch things up a bit and try a variety of Sara Lee® Premium Meats in this recipe. 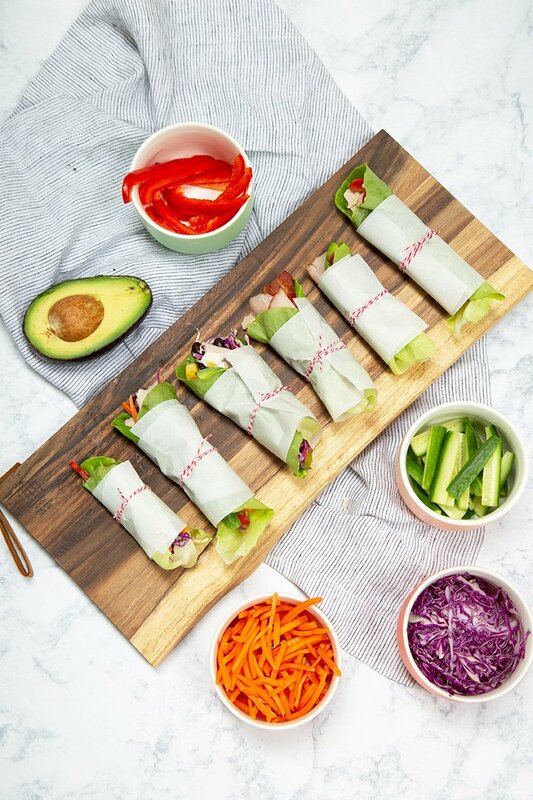 Pinwheels are just so versatile when it comes to planning lunch meals that it makes it convenient and easy to please everyone! The inside is gooey, soft and cheesy. The outside is golden brown and crispy. Each bite is loaded with honey ham deli meat, and it is incredibly delicious! 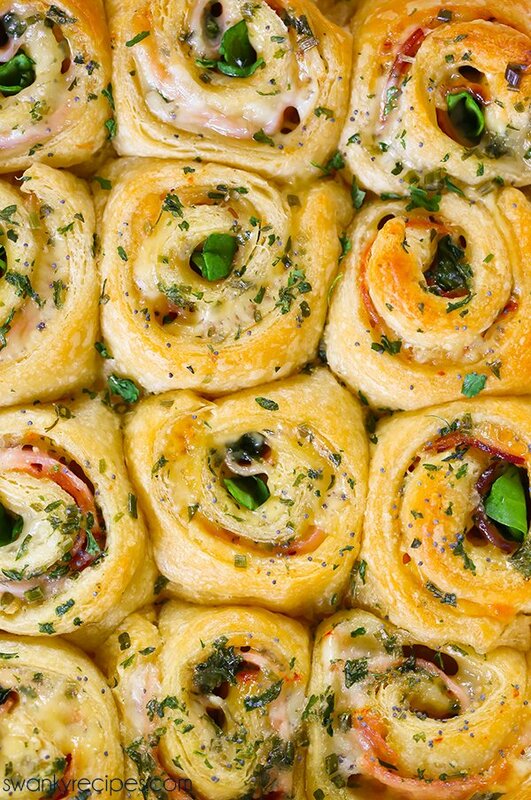 These Ham and Cheese Pinwheels will quickly become a family favorite for lunch! 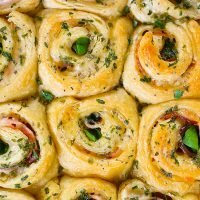 Not only are these cheesy ham pinwheels perfect for lunch or busy new moms, but they are also perfect to bring to a party! Buttery, flaky garlic butter crescent roll dough with melted cheese, baby spinach, and Sara Lee® Honey Ham. 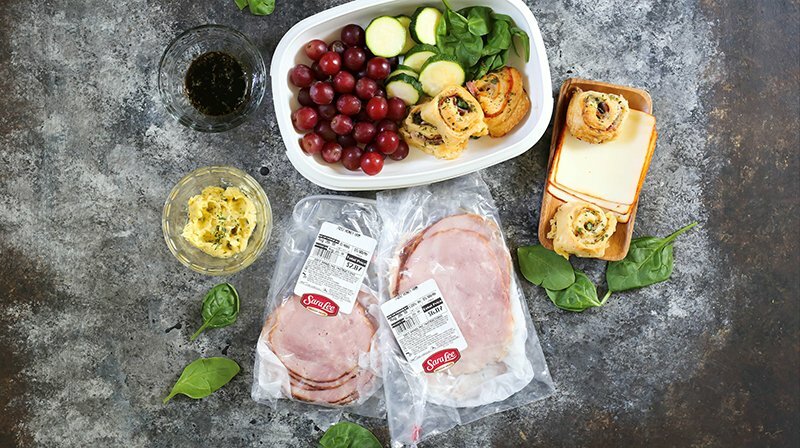 These Ham and Cheese Pinwheels are made four ways with a variety of flavored fillings, sliced deli meat and cheeses then baked until golden brown, gooey and crispy. Preheat oven to 350 degrees F. Grease an 8 x 8 baking pan with cooking spray. On a lightly floured surface, unroll dough and separate the sheet into 4 rectangles. Pinch the perforations to seal. Spread 1 tablespoon Dijon mustard on dough. Top with 2 slices gouda cheese, sliced ham and baby spinach. Spread 1 tablespoon garlic butter on dough. Top with 2 slices jalapeño jack cheese, sliced ham and baby spinach. Spread 2 teaspoons apricot jam on dough. Top with 2 slices muenster cheese, sliced ham, and baby spinach. Spread 2 teaspoons cranberry sauce on dough. Top with 2 slices jalapeño jack cheese, sliced ham and baby spinach. Starting with one short side, roll up each rectangle. Pinch edges to seal. Cut each roll into 4 slices. Place cut side up in baking pan. In a small bowl, whisk together melted butter, garlic powder and parsley. Brush over pinwheel dough, then sprinkle poppy seeds on top. Bake for 20-25 minutes, or until the rolls are golden brown.